At nearly a century old, the historic John Anson Ford Theatre was in desperate need of repair. The iconic venue sits in the hills of the Cahuenga Pass, across the 101 freeway from the Hollywood Bowl. After being closed for nearly two years for renovations, the theater will reopen on Friday, July 8, with a captivating set of Japanese drumming from TAIKOPROJECT and son jarocho music from Chicano rock band Quetzal. Architect Brenda Levin, known for upgrading LA City Hall, Dodger Stadium, Griffith Observatory and other local landmarks, has overseen the transformation of the theater, with a new stage, lighting, sound insulation, catering and other amenities. “The John Anson Ford Amphitheater, in many ways, was potentially underutilized and under-appreciated as a state-of-the-art performing arts venue. And I think it will be neither anymore,” Levin said. Because it’s set into the side of a canyon, rainwater flows down the hillside and through the theater, so it needed a new drainage system. The hillsides were redesigned by Mia Lehrer + Associates. Performers have a new stage on which to dazzle audiences. The old one was off-center and off-axis, and made of poured-in-place concrete, which was hard on dancers’ feet. The stage is still two levels, but is now replaced with a sprung floor made of Brazilian hardwood. The Ford’s 87-seat indoor theater, called “Inside the Ford,” has been replaced with an indoor grab-and-go food market. But a 240-50 seat enclosed theater has been built into an elevated Plaza on the south side above the parking structure, allowing the Ford to operate during the amphitheater’s off-season. Because sound bled in from the freeway and concerts at the Bowl, they’ve added acoustic paneling and a 40-foot high sound wall on top of the existing concrete wall. It has reflective material on the outside to keep away noise and absorptive material on the inside to improve sound inside the theater. About $66 million has been spent on these upgrades. The funding came from L.A. County capital projects funds and the support of private donors. The renovations are not complete. There’s a picnic terrace and concession stand that are expected to be completed in September, and there’ll be a full kitchen for the first time. The theater is located in a 32-acre park, and most of it is wild. Another aspect of the master plan is to create a public hiking trail, with views of the Hollywood Sign and Griffith Park. A transit plaza will allow vans and shuttles to drop off visitors off. And the stacked parking system will be replaced with an above-ground parking garage to reduce the traffic jams before and after every performance. The Ford is the smallest of the city’s outdoor amphitheaters, with 1,200 seats. The Greek has five times as many, and the Bowl has more than 10 times as many seats. And rather than sitting on a hillside looking down at the stage like at the Bowl, the Ford's stage is framed by the canyon on three sides, with a tree-covered hillside behind it. Another thing that really stands out about the Ford is the unique architecture. It’s been referred to as neo-Judaic. 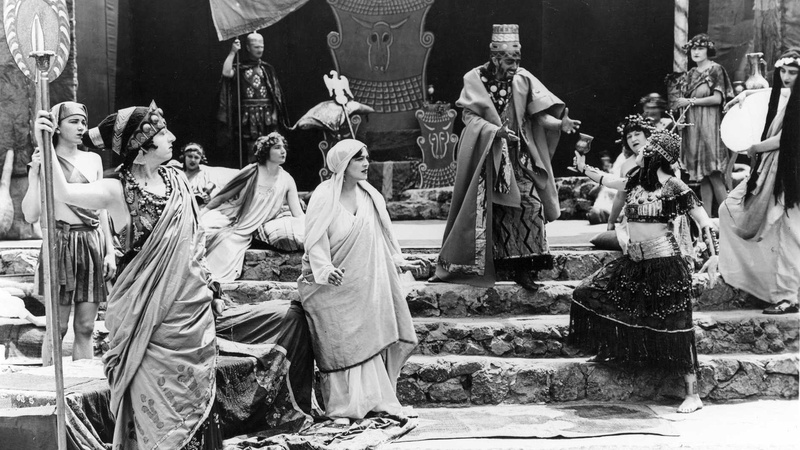 The outdoor theater first opened in 1920 as a home for the New Testament-themed “The Pilgrimage Play,” and designed to resemble the gates of ancient Jerusalem. The play was written by Christine Wetherill Stevenson, who was a key figure in securing the land and building the original theater. The play about the life of Jesus ran at the theater for more than four decades, and the venue was known as the Pilgrimage Theatre. The original wooden theater was rebuilt in 1931 after it burned down in a fire in 1929. The towers remain but the paint has been stripped off, so audiences can now see the concrete. In 1976, it was renamed in honor of John Anson Ford, the Third District county supervisor who was a strong supporter of the arts in LA.